Obviously this Italian beef recipe for sandwiches isn't BBQ'ed or grilled. But you can't grill every night, and good food deserves to be shared, even if it's done in a crock pot. This recipe is easy and results in authentic Italian beef sandwiches as good as anything you will get in a Chicago or New York sandwich shop. The beef, the seasonings, onions and green peppers slow cook all day, and when you walk in your house or apartment after a full day of work or play, the aroma is unbelievable. This is one of those recipes that you simply cannot screw up. And if you don't own a crock pot, please go buy one. They are great for all sorts of dishes, especially in the fall and winter. I prepare everything for this dish before heading to work, and over the course of the day the house fills up with great aromas that put a smile on your face after you return home after a long day. I have also let the meat cook overnight and take it in the crock pot for tailgating at football games. It's usually the first thing gone. Watch the video below that I made. It's painless...I promise! 4 lbs of Chuck Roast: Any inexpensive cut of beef will work. Do you have a question for Dave about this recipe? If so, CLICK HERE. 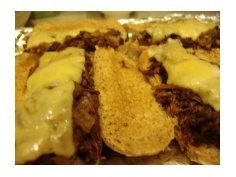 Leave Italian Beef Recipe and Return to BBQMyWay Homepage.